Darlington, Wis. – Some of the goals I set out to do this year was attend some tracks I haven’t been to in years and also check out at least one new facility. So far this season, I had accomplished one of those objectives; returning to some old venues (Maquoketa, Oskaloosa and Webster City) but up to this point, I hadn’t seen a new track. Before the season started, I was browsing thru track and series schedules and noticed on the Corn Belt Clash agenda an interesting stop on the ever growing list of tracks this series appears at; Lafayette County Speedway in Darlington, Wisconsin. Never having been to this track and only a short two-hour drive away, I penciled it in. 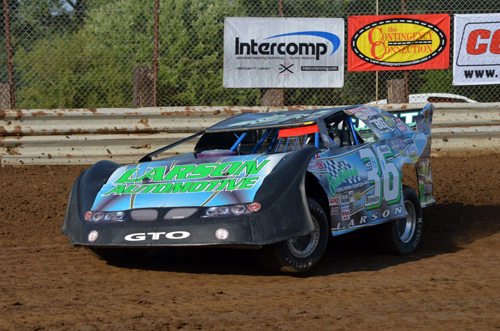 Lafayette County Speedway was the third and final leg of a three-day swing for the Corn Belt Clash, having raced at two familiar stomping grounds in the previous two days; Columbus Junction on Thursday and West Union on Friday. For those who like their race settings at old historic fairgrounds, this three-day swing would have been right up their alley. Darlington is right down the way from Platteville, Wis., right off of Highway 151. As it is with most of the “Cheese State”, it’s quite picturesque, complete with rolling hills, a small Amish community and when you get to the heart of the community, a town square. The town's motto is "A Place to Remember" and I could see why. The famous artist, Grant Wood (http://en.wikipedia.org/wiki/Grant_Wood), would have been right at home here with his paint brush and easel in hand. The track is advertised as a 3/8-mile but whoever was measuring that day must have been drinking or eyeballing it; it’s a half-mile track if I ever saw one. It’s has long straightaways with very narrow corners, which makes for some tight-knit racing. One of the track officials I was talking with before the race pointed out that the corners are not the same, with turns one and two more D-shaped and turns three and four perfectly rounded. “You can’t be on the gas hard when you enter one and two or you’ll be in the guard rail or over it,” he remarked. He mentioned there has been talk of re-configuring it over the off-season but we were both in agreement that it should be left alone. “It makes for more interesting racing and gives the track character,” he added. I couldn’t have agreed more. Another Wisconsin track which built its reputation around its unique configuration, Tri-Oval in Fountain City, totally overhauled their track a season or two ago, which I felt was a crime. I positioned myself at both ends of the track during the evening’s program just to see the difference on how drivers approached the corners and sure enough, you had to adjust your speeds and driving styles to manipulate both turns. As it was, most of the accidents that happened throughout the program, took place in turns one and two. It was a little tricky to say the least. 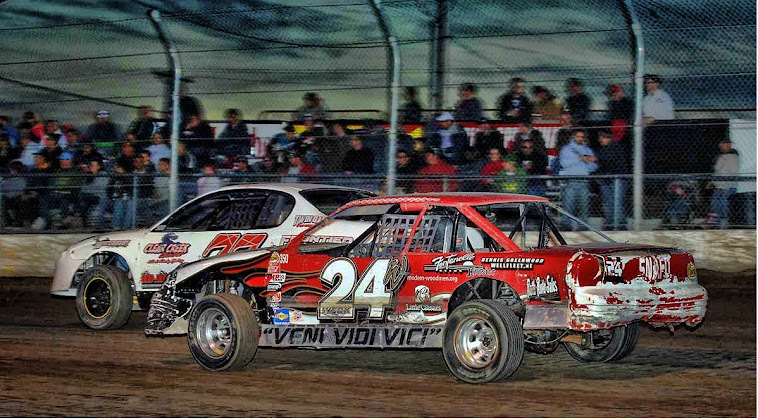 Lafayette County Speedway has been re-opened, closed, and then re-opened numerous times over the years and naturally has had its share of promoters, all thinking they had the answer(s) to making the track successful. 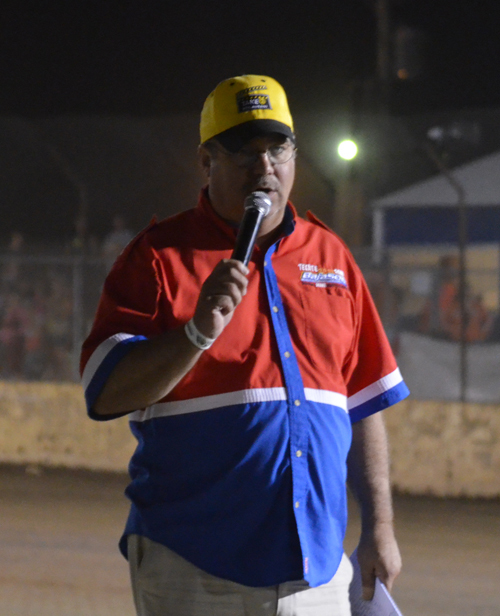 Jay Etheridge, who has an extensive racing background, is the latest promoter who has been given the reigns and it appears the folks managing the Lafayette County Fairboard made a wise decision. Several people I talked to this evening mentioned that Etheridge has really shaped the place up and in turn, more race fans and even more race cars have shown up to support the cause. 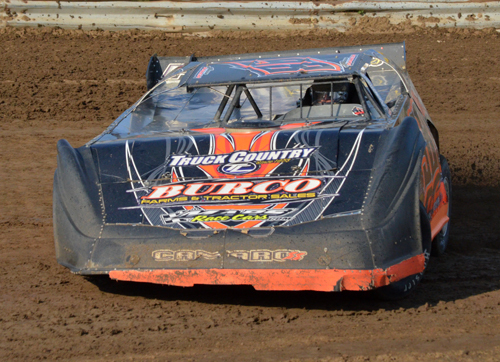 Late Models, Modifieds, SportMods and Four-Cylinders are the main headliners every Saturday night and car counts have been steady in each division. One of the highlights for me on this evening was to listen to track announcer Doug Collins giving the play-by-play. Collins has one of those great voices you hear every so often in racing that is pleasing to the ear. The fine folks in Darlington should consider themselves lucky to have such a great announcer; Collins is very knowledgeable about the sport and his passion for calling the action shines through on every lap, from the first green flag to when the final checker waves. In fact, Mike came right over before the race, introduced himself and told me, “If you need anything or have any questions, let me know”. I thoroughly enjoyed chatting with Mike throughout the evening and getting some local insight on the history of the facility. You can check out Mike’s great photos at http://www.aamikesphotos.smugmug.com/. 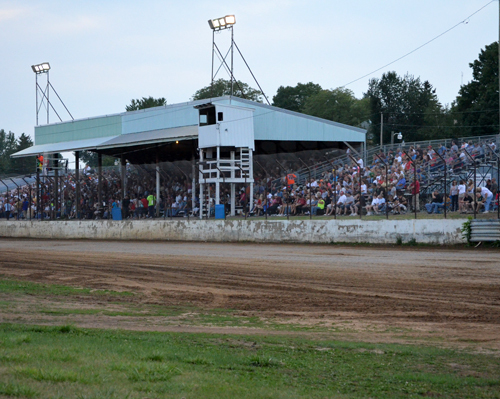 According to the locals I talked to, the appearance of the Corn Belt Clash Series was the biggest thing to hit the race track in years and judging by the full house on hand tonight, that was the understatement of the year. There weren’t too many empty spaces in the old covered grandstands or the bleachers to speak of and you could tell by the overall buzz from the crowd, the fine folks in Lafayette County had been waiting for this event since it appeared on the schedule. Chris was giving his brother a run for his money at Columbus Junction on Thursday night, until something broke on his mount, giving Chad the victory. 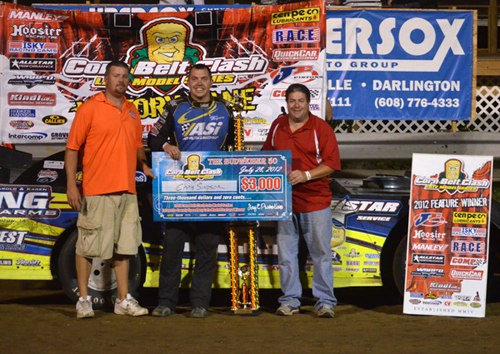 But tonight at Darlington it was all about Chris Simpson as he pulled past his sibling on a mid-race restart and wouldn’t look back in picking up the $3,000 winner’s share of the purse. But the Simpson and Simpson duel wasn’t the main story line. Once again, it would be Jason Rauen’s driving performance in the 35-lapper that would have the half the fans in attendance chattering about what they had witnessed and the other half shaking their heads in disbelief. It was a great night of racing at Lafayette County Speedway. Etheridge and his talented staff left no detail untouched, prepping a great racing surface, staging a fantastic program and sending everyone home with hopes that they do it again in 2013, myself included.